Both the speakers are renowned authors of management and marketing books. A few years back at Marketo, a demand generation engine used to exist, which was extremely effective. This engine was responsible for around eighty percent of all sales conversions. However, as the organization grew, its members now wanted to attract the bigger names and started casting their net wide. They then realized the limitations of traditional demand generation. They realized this method was literally about fishing using traditional nets. There was no control over the type of fish caught. On the other hand a more strategic input was needed to get those really big fish of choice. This gave birth to a new organization called Engagio and subsequently the market for Account Based Marketing (ABM) also grew. While utilizing the ABM principles, it was realized that the net total of all such marketing tools being used, resulted in a mere fifteen percent shift. Thus instead of marketing alone, a more holistic process involving several other approaches was needed to crack the code. A more personalized style of digital marketing involving social media and emails is needed. The holistic process involving ABM, Account Based Sales, Account Based Sales Development and Account Based Customer Success is together categorized as Account Based Everything (ABE). This method is so inherently customer-centric that the campaign becomes subordinate. Any ABE plan does not take off until thorough research is available on the customer base before the campaign may be designed. · It allows penetration to more specific clients to drive better deals. · Inbound marketing as a principle has been yielding reduced returns; this has meant that greater efforts at needed at outbound approaches. · Technology has now made it possible for ABE to be scaled to deliver solutions to greater number of people. Content that is good for inbound marketing, is generally good for ABM as well. Simply, good content is hard to find and must be leveraged whenever identified. When it is not good, it gets passed off as Spam or cold calling. Before creating specific content, it is necessary to conduct through analysis of the customer. Deep insights will bring valuable business intelligence to the content creators so that relevant content can be distributed. Social media is a very good platform to listen to customers. It is personal and used regularly by people. Thorough knowledge of customer segments must be similarly backed up by insights on industry, business issues and innovations. ABM is a thoroughly customer-centric methodology. Relationships ought to be built and the history of transactions studied. Door-openers also need to be established to get foothold into any organization. A checklist for this research must be compiled. 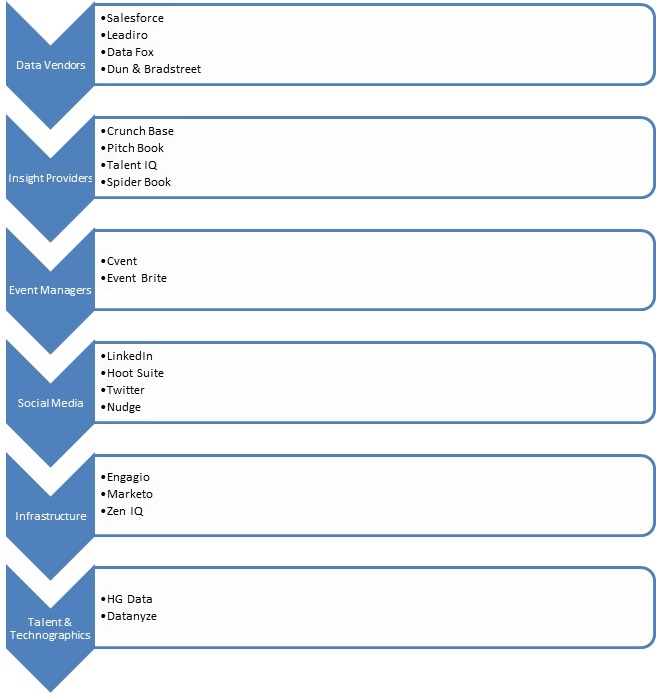 The checklist must include items such as – market dynamics, key trends, growth drivers or inhibitors, financial health of company, SWOT, growth areas, initiatives worked on, organizational chart, key contact persons and company culture. · Direct chats during sales rounds or events. · Reports from common connections. · Press releases, investor calls and annual reports. The following pyramid will help explain the various strategies of the ABE approach. 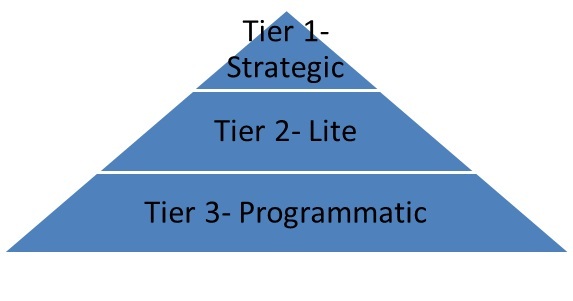 At the Strategic Tier 1 level, only the top connections must be placed at. Here all connections will be personalized but not more than a maximum of fifty key accounts must be placed here. A maximum of a thousand accounts can be placed at the second level known as ABM Lite. Traditionally, only the top tier was known as AB, but now the others have come under the umbrella. This segment must be lighter on research as too much of it will not be relevant. At the third tier, automated touches are preferred. There is no limit as to number of accounts, depending on the size and complexity of the marketing organization. This level is also called Programmatic ABE. 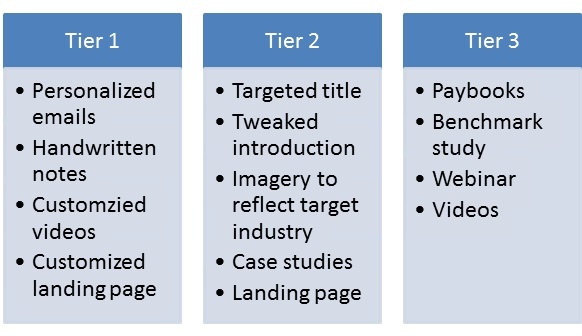 The following table collates the kind of content ideal at each ABE level. · Primary and next level research must be conducted. · A deep audit or analysis must be made on resources or data already at the content creators’ disposal. · Instead of being rigid, the creators must be bold enough to tweak the delivery as per market relevance and customer needs. · An editorial calendar ought to be created, according to which the posting and delivery will take place. · Existing plans must be tweaked according to the corporate strategy being followed at that point in time. The strategies that could continue being successes must be retained. · Content must be seen as modular assets that can be used repeatedly, though not exact replicas, but modified ones. · Hubs must be designated around which campaigns can be run. · Personalized content experiences need to be developed. · ABM is not mass-marketing, thus quality is always preferred to quantity even at the relatively lower tiers. · Editors are often under-valued but they bring great benefits to the business. They are inherently audience-centric and understand the pulse for the content consumption. The brand must opt for talent recruitment of any editor with real world publishing experience. · The high level customization must only be applicable to Tier 1 clients. To end this write-up, it is very important that marketers realize that good content is always valuable whether it is ABE(M) or content marketing. However, in ABM, due diligence must be made to ensure the impact is measurable. Also there must be sufficient coverage to undertake such a campaign. This includes enough data or contacts to go ahead with the plans. Instead of maximum reach, the focus ought to be on the right contacts. The target accounts must be provided sufficient information about the marketing organization. And finally, there must be multi-pronged engagement with key stakeholders. This includes the right employees manning the key accounts.